Dupuytren contracture, also known as palmar fibromastosis, is a genetic condition seen most commonly in individuals of northern European descent. The condition can result in abnormal growth of tissues in the palm of your hand, either in the form of “nodules” in the palm or “cords” in line with the fingers. Over time, these tissues can contract and result in the finger curling down into the palm. The cords and nodules are not usually painful, by if they progress and grow, they can result in an inability to fully open the hand. This can cause problems with wearing gloves, placing hands into pockets, and other normal activities. For mild cases, watchful waiting is usually advised. 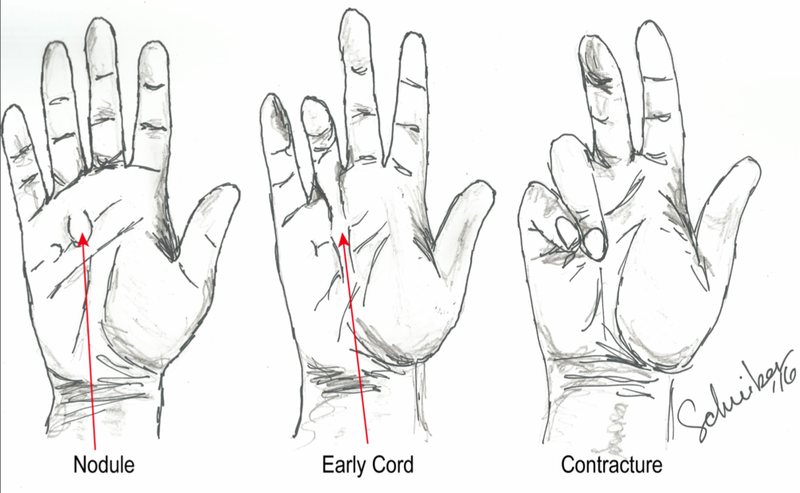 As contractures develop and affect function of the hand, other interventions can be considered. This typically involves 1) collagenase injection (Xiaflex), 2) needle aponeurotomy or 3) surgical excision. Xiaflex is a FDA improved medication that is injected into the cord, and has been shown to be effective at dissolving and breaking the cord. The medication is a collagenase, meaning it is an enzyme that dissolves collagen, the abnormal tissue present in the cord. Xiaflex treatment involves two steps. Needle aponeurotomy is more popular in European countries, and involves placing a small needle through the skin under local anesthesia. The tip of the needle is used as a “knife” to divide the Dupuytren cord. While surgical excision of the diseased tissue is more invasive than the other two options, it has the benefit or removing all of the diseased tissue, rather than simply dividing or snapping the cord. This may result in a lower recurrence rate. All treatment options have unique benefits, and oftentimes the specific location and extent of involvement makes one preferable to the other. The ideal treatment is best chosen after a thorough discussion with your physician. After all treatment options, hand therapy may be needed to optimize motion of the fingers. Oftentimes, wearing a splint at night for the first 3 months after treatment is done to hold the finger straight and decrease the chance of recurrence. For more information about Dupuytren contracture, read the blog article written by Dr. Schreiber.